Haha, what am I implying here, really? That Scott needs to update more often? That he has a lot of money? (How would I know THAT, anyway?) I’m not sure, but I thought the line ”here, have some money” was kinda funny. 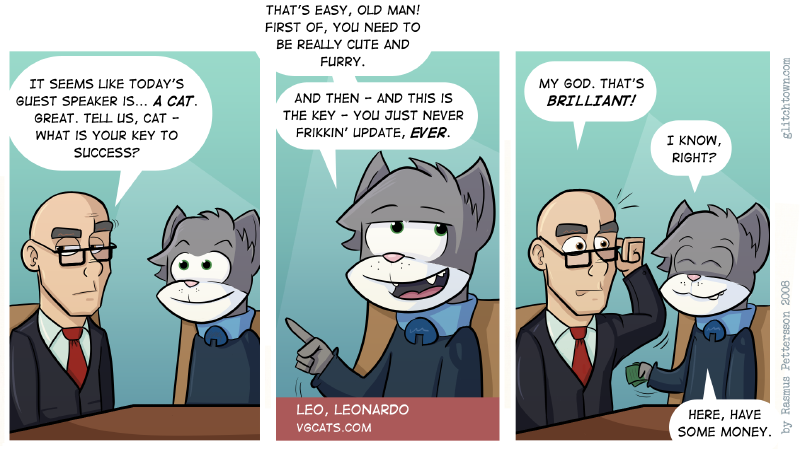 And VG Cats needs to update more frequently, really. Although, it seems like he’s given up on it. However, I love VG Cats, and I’m sure Scott won’t take this to serious if he ever sees it. All in good fun, amirite? This entry was posted on Monday, July 21st, 2008 at 3:47 pm and is filed under Comic. You can follow any responses to this entry through the RSS 2.0 feed. Both comments and pings are currently closed.